Samantha Watson started improv purely by accident—stumbling into a workshop at a retreat. Not knowing what the workshop was, she fell in love with improv and has been doing it ever since. Samantha has trained at WIT and the Unified Scene Theater. All the improv classes made her crave stage time. 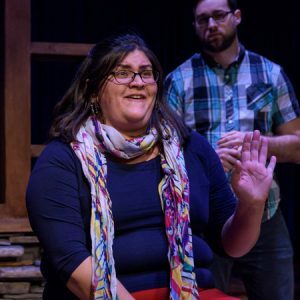 That, coupled with her 10-year-old forbidding her to sing to him or in their home, led Samantha to take her off-key singing to the stage with Laughing Index Theater’s Wonderball, a musical improv team, where she masked it as comedy AND enjoyed publicly embarrassing herself and her son. Having lived in DC since 2001, Samantha considers herself to be from DC. She has a wonky job in international development (further evidence that she is a DCist), but also gets joy from her leadership coaching business and from improvising. She has two sons—one of whom is an amazing fireball about to enter middle school and the other likes long walks and chewing on bones. Samantha herself likes long walks on the beach and in Rock Creek Park, but doesn’t particularly care for bones.